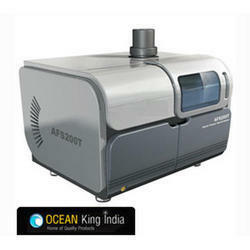 Pioneers in the industry, we offer ocean series atomic fluorescence spectrometer afs200t from India. AFS200 T: As, Hg analysis expert! Fully external PC controlled Atomic Fluorescence Spectrometer, specifically applied to As, Hg, Se, Sb, Bi, Sn, Te, Ge, Pb, Cd and Zn 11 kinds of element detection at the ng/ml range. Accurate, Reliable, Easytouse, Ultra low detection limit. Monochromator : Non dispersive optical system: greatly improves testing sensitivity and the signaltonoise ratio, and makes the instrument structure more compact and easytouse. Lamps : Fixed 2Lamp with 2 independent lamp power supply. Two kinds of different elements will be detected by the instrument in one sample. The light source is artificial intelligence HPHCL(High Performance Hollow Cathode Lamp). The lamp is easy to replace and adjust by the user. Shielding Quartz Pipe Atomizer: All quartz with argon carrier gas and argon protect gas. No need external fuel gas by using the solution reaction of hydrogen. Position Adjustment : Very easy to adjust the height of the atomiser by the user. Flame Monitor : Real time flame monitor: which is very convenient and easy to use. Gas Control System : Fully computer controlled carrier gas and protect gas control system, with gas flow or gas pressure detecting system. Gas flow will be cut off automatically to minimise gas consumption when instrument is not working. Computer controlled automated flame ignition and extinction. Peristaltic pump Sampling System : With one pump for sampling and one pump for removing waste liquid. Pipe : All PTFE, corrosion resistance. Environmental Friendly : Special waste gas collecting and disposing device is equipped to the instrument and provide safer operation environment for analytical personnel. Software: The Ocean AFS200 analysis software is researched and designed independently by Ocean and based on the windows operating system. User friendly interface and easy to use. Communication Interface : Standard USB2.0: faster than RS232 interface and compatible with the latest computer. Looking for Atomic Fluorescence Spectrometer ?